Apartment is situated in a 18th-century building, in the centre of old Krakow, mere 100 metres from the Main Square, one of the largest and the most beautiful European plazas. 2 bedrooms, living room, wonderful view, fully air-con, small terrace - very stylish! A two-minute stroll along Mikołajska Street brings you to the splendid Small Square surrounded by mediaeval houses, then past the magnificent basilica of Virgin Mary to the Main Square, the hub of city life. In its immediate vicinity, there are numerous landmarks and museums, as well as a wealth of cafés, restaurants, bars and pubs offering Polish and international cuisine. At the Main Square, you may take a horse-drawn cab or an electric cart to visit other tourist attractions of Krakow. 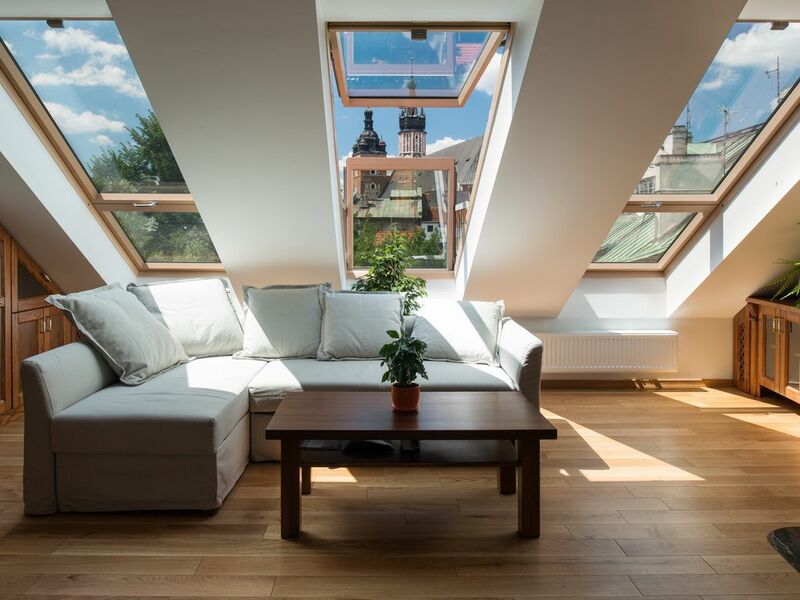 Despite its location in the centre of Krakow, this third-floor apartment offers peace and quiet with its windows overlooking the Old Town. Its interior design: the subdued colours of the walls with decorative stone elements, the original parquet floor and wooden furniture, has been adapted to the history of the building. The apartment consists of 3 rooms, a kitchenette and 1 bathroom. The well-lit living room, which may also serve as a dining room and an additional bedroom with a double convertible sofa, provides enough recreational space for six persons. The kitchenette, is equipped with a ceramic hob, refrigerator, microwave, toaster, dishwasher and other utensils. A washing machine and an iron are available as well. We were fortunate that Araceli was able to accommodate us for an early check in at this wonderful apartment. The views are fantastic from this third floor property. It so well designed, with high quality bespoke wooden fittings. It was extremely clean, with cotton bedding. There is a lift up to the top floor, and a short flight of internal steps within the apartment. There is a great sound system, where we were able to connect the iPhone for music. The little balcony is a perfect place for a cuppa. We didn’t use the mezzanine bed, but this has its own separate door to the area, wardrobe and dressing area beneath. The aprartment is in a great location in the old town, with lots of restaurants and attaractions within a short walking distance. We only used transport when we visited Auschwitz (organised trip) and the Salt Mines (using the train). It is about a 15 minute walk from the train station to the apartment, and very easy and cheap to use the train to get from the airport. The Wawel Castle, Cathedral and Dragon’s Den are well worth a visit. The main square was the place to sit and watch the world go by at any one of the numerous restaurants surrounding. Patio heaters and blankets to keep off the qutumn chill. Cafe Camelot was a great discovery for breakfast/lunch/cake! We would recommend a visit. There are lots of small Carrefore supermarkets around, and a great deli on the far side of the main square that is hard to spot as it looks like a restaurant and is hidden by trees. The only minor niggle we had was that there were only 2 very small wine glasses in the apartment (not like the lovely array of glassware displayed in the photos). We would certainly recommend this apartment to anyone wanting luxury in the heart of Kraków. Absolutely beautiful modern, well appointed apartment. Quiet despite being close to everything. Loved this place!